Bodegas Halcón, first place prize given by the Deputation of Sevilla for the wine most generoso. The president of the Diputación de Sevilla, Fernando Rodríguez Villalobos, along with Councilor of Tourism Francisco Javier Fernandez, wholast night presided over the delivery of the third edition of the Prize for the best wines of the province, in an act that also counted with the participation of CES(Confederación de Empresarios de Sevilla) president, Miguel Rus. The event was held, like last year, at the Consulate of Portugal, with the assistance of itsholder, Joao Queirós, apart from mayors and councilors of the province along with several world-renownedexecutives, culture, communication, social agents, and professionals in the touristic sector. 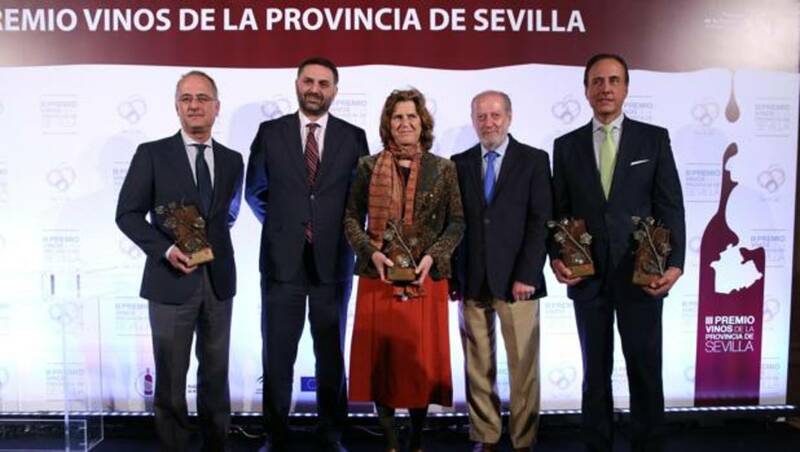 It is an award promoted by Prodetur-Turismo de la Provincia, to promote greater knowledge of the wines produced in the Sevillian territory, encourage consumption, and improve the image and position of the sector. The objective is also to promote the culture of wine in the province as a tourist experience, in which the set of resources of the Sevillian viticultural areas are integrated. All the producers of the wine from the province of Sevilla were able to nominate themselves, with different tasting categories: Calm white wines; still red wines; liquor wines and wines from overripe grapes; and unique wines from the province of Seville. Inthe category for liquor wines and wines from overripe grapes, the gold prize was given to La Giraldilla (Palo Cortao), from Bodegas Halcón. If you would like to read the entire article from ABC Sevilla, click here. It is in Spanish.